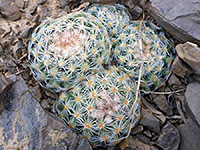 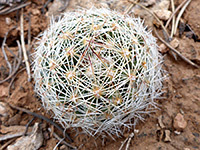 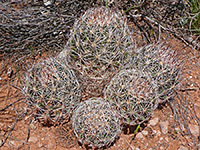 Apart from some opuntia, escobaria vivipara (formerly classed as coryphantha vivipara) is the most widespread cactus in the US; the species has good frost tolerance and has adapted to a wide range of habitats, from Mexico all the way north to Canada, where it is one of only four cactus species in the country. 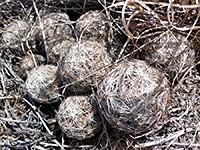 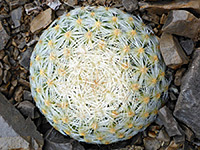 The plant is somewhat unremarkable; a globe or small cylinder, generally less than 2 inches in diameter but sometimes up to 8 inches, single or forming low clusters of 20 more stems, their surface covered by pronounced tubercles bearing 10 to 40 white radial spines and 3 to 12 central spines, darker in color, pointing outwards at various angles. 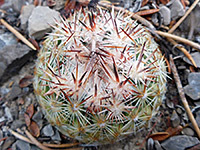 Younger specimens have only the radial spines. 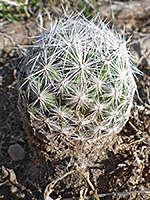 The tubercles are marked with a groove along the upper surface, more evident in older plants - this is one feature that distinguishes the cactus from the similar pediocactus simpsonii, as that has no grooves on the tubercles. 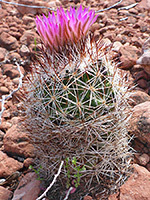 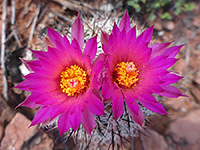 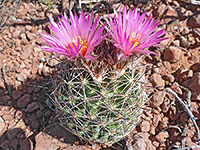 The showy pink flowers make the cactus much more noticeable; they appear any time between spring and late summer, and are followed by green fruits. 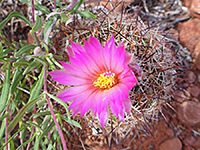 As expected for a species with such a wide range, a number of regional variants have been proposed, mostly specific to the Southwest states, with different spine numbers and flower characteristics.